Angelica Alvarez was granted asylum in late April, two months before the Trump Administration barred asylum seekers who are fleeing domestic and gang violence. In her native Honduras, where pervasive gang violence, and increasing unrest have roiled the country, Alvarez, 34, worked as a hospital custodian while raising four children. But danger, often clinging to her own husband, chased her from her country to America’s political faultline — the U.S.-Mexico border — where she, like many others, asked for safety. On her journey to the United States nearly two years ago, she had escaped her abusive husband, left behind two of her children, evaded a violent drug cartel and avoided being locked up in immigration detention for months as she pleaded for asylum. Then, in April, just days before an immigration judge was to rule on what amounted to a potential life-or-death decision — her asylum claim — a fire engulfed her West Valley City apartment. 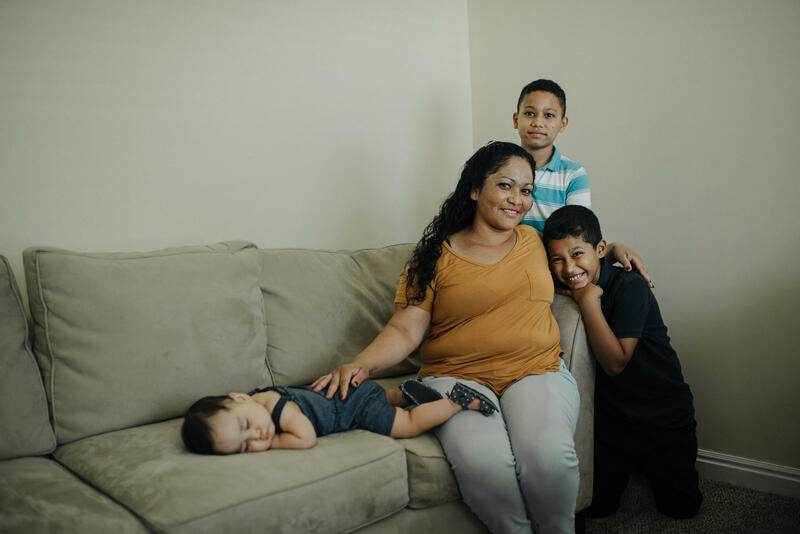 Exhausted from her graveyard shift cleaning up a TRAX station, Alvarez slept through the short circuit that ignited her kitchen, the broken fire alarm silent. As the smoke rose and she awoke, Alvarez grabbed her 8-month-old infant and two other children, and then, they fell. “We escaped the fire by jumping out of the window from the second floor,” she said in Spanish. Four days later she sat, disheveled and traumatized, before an immigration judge for her final asylum hearing. With the immigration judge’s ruling in her favor, Alvarez may be one of the last people in the U.S. to be granted asylum because of gang violence or domestic abuse in their home countries. Earlier this month U.S. Attorney General Jeff Sessions announced that people seeking protection with those kinds of claims would no longer qualify for asylum, making their already long-shot cases nearly impossible. The move is one of several recent efforts by the Trump administration to tighten U.S. asylum policy. As of December nearly half of the roughly 2000 cases in Utah’s immigration court involved asylum. With a claim of domestic abuse that is similar to hers, Alvarez’s sister is one of those asylum seekers whose cases have been barred by the change in policy. “Her ex-husband is threatening her and has been very abusive. I am scared that she will be sent back with her children and something may happen to her,” Alvarez said. Under the Trump administration, her sister may not have a case. 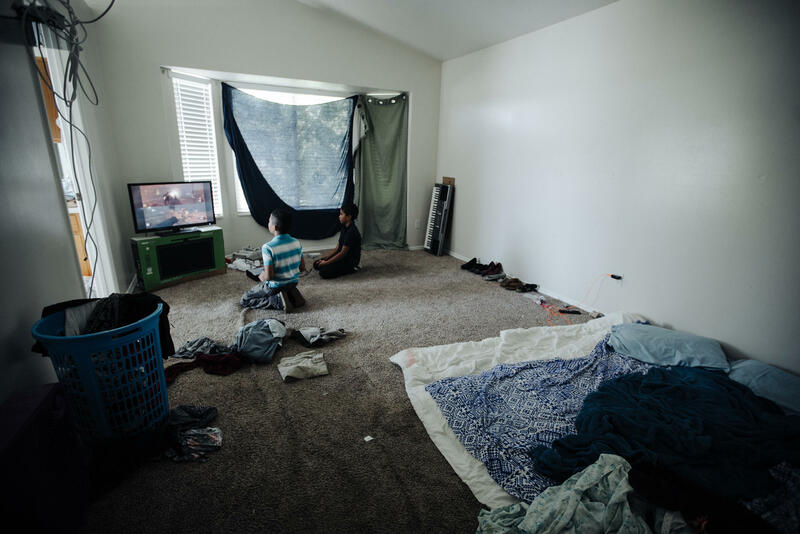 Inside Alvarez’ new home, her son and nephew play video games in an empty bedroom. Angelica Alvarez' son and nephew play video games on a donated television and game console. The family lost their furniture in an apartment fire. Clothes and blankets line the floor where they sleep. Sitting on a tan, suede couch donated to her after the April fire, and rocking her infant daughter, Alvarez recalled her troubled life in Honduras. Utah, where she had family, beckoned as a safe haven, but she had to make a choice. With her earnings from cleaning a hospital, she could only afford to pay a smuggler to bring her and two of her children across the border. The other two had to stay behind. By foot and car they traveled north into Mexico, where the trip became increasingly treacherous. “It was a very scary situation,” she said. “We were chased by the cartels called the Zetas. The were trying to capture us. The chauffeur of the vehicle we were in was able to get away from them. But I was terrified." They reached the U.S.-Mexico border, then crossed the Rio Grande in South Texas, where she turned herself into police, and asked for asylum. She didn’t trust police in her home country, but she had reason to believe police in the U.S. would be on her side. Alvarez spent three days in detention without her children, but was later reunited with them at a migrant family shelter. They stayed there for 15 days before traveling to Utah, where her two sisters live. The Trump administration’s stance is asylum should only be available for people fleeing persecution or fear because of race, religion, nationality or membership in a particular social group or political opinion. In his announcement, Sessions highlighted a backlog of more than 700,000 immigration cases. He said immigration judges have found that the vast majority of those cases are eventually ruled invalid. The Executive Office for Immigration Review, which oversees 60 immigration courts and more than 330 judges nationwide, is part of the Department of Justice. “The asylum system is being abused to the detriment of the rule of law, sound public policy, public safety even and to the detriment of people with just claims to asylum,” Sessions said. Sessions has said that the asylum denial rates are as high as 85 percent. While denial rates have been rising over the last five years, the Syracuse University-based Transactional Records Access Clearinghouse, which analyzes immigration court statistics and other government data, pegged the number at 62 percent in a November 2017 report. Ashley Tabaddor, the president of the National Association of Immigration Judges, which advocates for judicial independence, said that the backlog is misused to push an agenda. Immigration judges don’t hear cases presuming the asylum seeker is lying or telling the truth, she said, but let the facts speak for themselves. Marti Jones, a Salt Lake City attorney, said in countries where there is no state control over unrest, violence falls heaviest on women. That’s why for years, Jones and other immigration attorneys successfully made the case that domestic violence victims deserve asylum in the United States. “Because the single biggest indicator of whether you’re going to be a victim of violence in the world today is whether you’re female,” she said. With the new Trump administration directive, it’s going to be more difficult, time consuming and expensive, she said. But it won’t be impossible, which is why Jones won’t back down. “When countries refuse to or are completely unable to begin to protect their women and children, then it is, I believe, in accordance with our international obligations as a country, not to return people to their deaths,” Jones said. 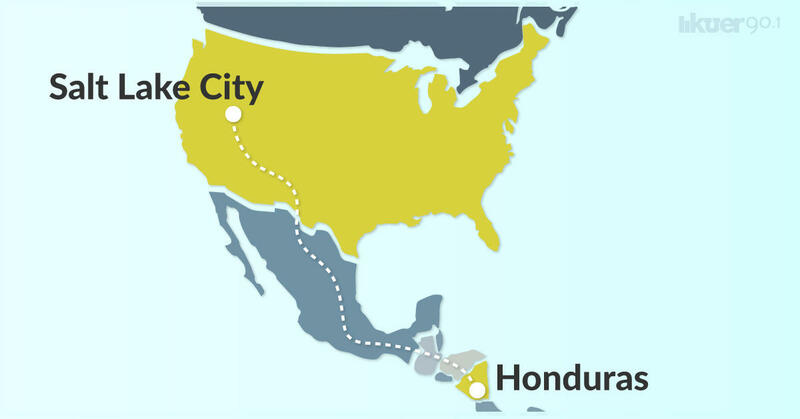 The vast majority of the 20-30 asylum cases Jones has now come from the Central American countries of Honduras, Guatemala and El Salvador. Angelica Alvarez with her two children and her nephew. Alvarez is waiting for two more of her children to arrive in the United States from Honduras. Back at Angelica Alvarez’ home in West Jordan, Alvarez said she had a hard time understanding the Trump administration’s logic about who deserves protection and who does not. For now, Alvarez can breathe a sigh of temporary relief in her empty home. But rent is still due, and without a car she is looking for work with an easy commute. She doesn’t mind that she doesn’t have a kitchen table or a bed, although she’ll need to get some soon. In late June Alvarez learned her two other children received permission from the government to come live with her in Utah. She hopes they'll arrive by Christmas.